Ozone therapy is fast becoming the most versatile therapy in medicine. Doctors have been using it for over fifty years. There are over 2500 articles published in the scientific and medical literature describing how ozone therapy can be used in virtually every medical condition there is. The reason is that ozone is a highly active form of oxygen, and nothing stimulates the healing powers of the body more than oxygen. The problem is, much of the information on the internet regarding ozone and how to use ozone is not accurate. 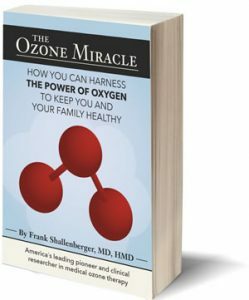 Dr. Frank Shallenberger MD guides us through the use of ozone and provides us with the quintessential book on Ozone Therapy, “The Ozone Miracle”. Dr. Frank Shallenberger, author of The Ozone Miracle, is the president of the American Academy of Ozone Therapy (www.aaot.us). He is also the godfather of ozone therapy in the United States. He has published the only book on ozone therapy for medical professionals in the Unites States, The Principles and Applications of Ozone Therapy, as well as several other books describing how oxygen heals. The Ozone Miracle is written for you, the proactive health consumer. It describes the remarkable 200 year-old history of ozone therapy that includes such important scientific luminaries such as Nikola Tesla and Werner von Siemens. It also describes the science behind ozone therapy. But more importantly, it offers a paint-by-numbers system that allows you to harness the power of ozone therapy right in your own home to improve your health and prevent disease. From eye conditions, to flus, to bladder problems, to cardiovascular diseases and most things in between The Ozone Miracle has many simple, safe, and natural solutions.